This is my 5th Ladies of the Sea quilted in the last 12 months. It will be my last for a while. The amazing applique artists that send me these quilts are wonderful, but I need a good 6 month break, This is a grueling 2-week quilt to quilt. After a while the amount of detail work required to carefully quilt around each and every applique starts to make your back, arms and neck tired. So if you are out there and think you want your's quilted, you can inquire with me, but it will be into 2017 before I actually will quilt it. This is by one of the students of the person that did the 2nd one I quilted (see Dec 2015). The applique and embroidery on this Ladies is absolutely phenomenal. There's not a stitch to be seen, or a thread out of place. It is THE kind of quilt I'd want to get if I were collaborating on a show quilt with somebody - no issues whatsoever! The hardest part of my job is determining what to do to make it different and unique from the others. I made small tweaks from previous plans. I introduced a lovely pink-purple variegated thread on the feather work to help tie the central part of the quilt to the stars in the corners. From afar, the colors don't really show, but up close, it is this. The feathers create a lovely secondary pattern for the background, breaking up the fact that it is just sashed squares. The ship blocks are essentially the same as what I have done before. It works, and I just could not reinvent this wheel in a better way. Some quilts are like that. The variegated thread is also on the backfill around the mariner stars. And a few shots of the gorgeous backside... The bobbin thread for the clear ditchwork is actually a sage green, and it shows the outline of everywhere I quilted beautifully. Normally I choose a thread best matching the background fabric, but this time I ventured out! This week brought a phone call I seriously hoped would come, but really never thought would. Only a fool believes that they really will get THAT call. OK, not a "fool", but a definite day-dreamer! I'll admit, I definitely did day-dream a bit about this, but then was completely oblivious when the call actually arrived. My Facebook friends already know this...My quilt Bouquet Royale is receiving one of the top 8 awards at the Houston quilt show in November!! I sent it truly hoping it would just get accepted in the show. With a nearly 50% rejection rate, you really never know. 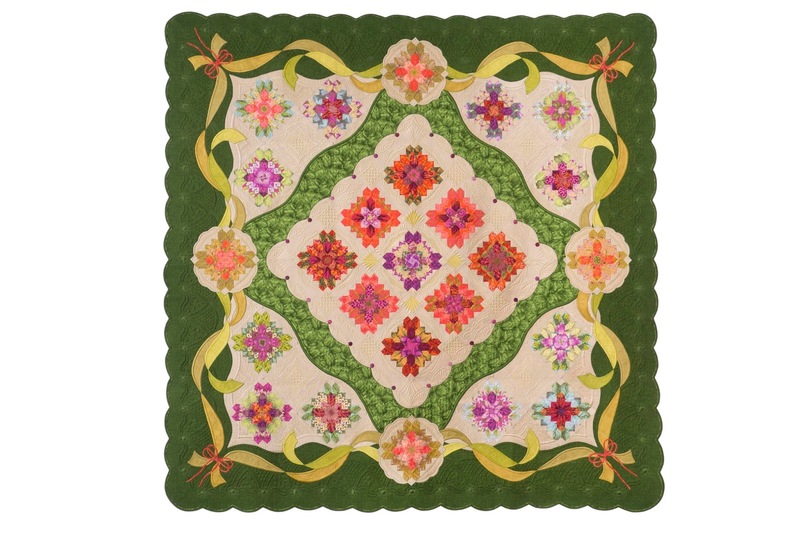 All too often, quilts you believe should be in the show, do not make the jury cut. Then comes judging... Houston judging is like none other. Now, I have had 3 quilts in the show prior to this year, so my experience is a bit limited, but I have talked to others who share similar stories. The 3 judges chosen are from all walks of the business. 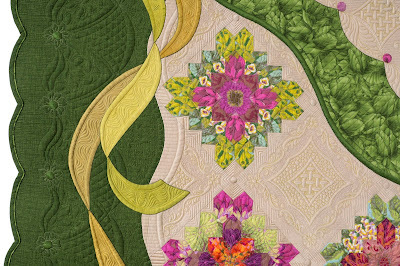 One might favor art quilts, while one knows a lot about technical quilting. You never know who is judging until the awards either. My technical style has not always appealed to all judges. Likewise, my color choices, which are very personal to me, have not either. I kind of figured the renegade orange and lime green might be a turnoff. Because I felt that I was maybe not judged as I'd like in the past, I chose not to make travel plans to attend the show. I am teaching at MQX Midwest in mid-October instead. 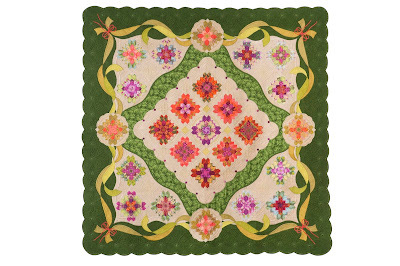 I hoped that the judges would see past my colors and see the quilting, which to me is the essence of the quilt. It is complex, and took forever to execute. On November 1st, we will learn which of the 8 top awards this quilt will receive. In actuality, there are really only 5 it could get, and they are all good monetary awards. To top it all off, because it is a top-8 awards, Houston provides the transportation and hotel!! I am going to Houston for 5 days afterall. So if you are there, definitely find me and say hi. I will be near the quilt some of the show for sure. No predictions, no secret wishes that I will share for the outcome. Getting this far is pretty unexpected all by itself. The details on the shield and eagle's eye are amazing. Likewise, she has a real map for this globe. All the ships have detail embroidery to make them more authentic. See the tiny portholes? This picture is majorly blown up - This is all hand embroidery, not to mention the perfect tan fabric for a paint pallet and brush. Yesterday, I barely started on the details - the part you actually see. I work hard to try to make all of these quilts be slightly different. This one has pretty purple corner mariner stars, so I chose a bolder Aurifil variegated thread for some of the "show" quilting. It will help tie the center of the quilt to the deep purple of the border and corners. I'll finish up how these will look tomorrow. Here's a mariner's star. The star itself is not done yet though. In another week, I should have the entire quilt done and ready to show! This is a gigantic Fire Island Hosta quilt, measuring in at 100"x106". It is perfectly pieced, but immense. Just the ditching of every pieced seam, which yes, I do...took a whopping 8 hours. I think that the ditch stitching holds the perfect lines of the piecing. It also allows me to ditch the entire quilt, and then go back with each individual color thread, rolling the quilt to where I want to be. Ditching is a great stabilizer, to the point where not that much other basting is needed. This has a single wool batt. I used YLI polished poly and Glide threads in a variety of colors -- blues, white, peach. All of the fabrics on this quilt are non-prewashed batiks. Now, this is not a bashing of the maker in any way shape or form. Many, many people out there still choose for one reason or another not to prewash. But, I want to try my hardest to convince you why you should change your ways. Prewashing is good. <> Prewashing is good. When a quilt has fabrics that have not been prewashed (or presoaked), especially batiks, I absolutely refuse to premark the quilt. THAT is something I like to do with monstrous quilts so that motifs can be symmetrical (and in case I forgot what I did 50" earlier! Aquas and deep blues are some of the absolute hardest dyes to get to come out. You can ask me how I know, but many of you read this blog 4 years ago when my Rainbow Nouveau quilt nearly bled into the non-usable realm. I won't tough a batik without soaking it in very hot water for many hours, several times. One of the other things that happens with batiks -- and this is the one that sends most machine quilters to the hills screaming. Sometimes, and this is a very unpredictable occurrence, these fabrics because they are supremely tight, can cause thread shredding and tension anomalies. I have quilted many batik quilts this year, and I even let a few of the backings past my quality controller (normally I request no batik backs) - which caused no issues at all. This quilt though tested every realm of calm I could muster. Threads shredded. Tension was periodically amuck. And the kicker of them all, about a dozen broken needles. The needle would hit a seam and just snap. I just had my machine serviced and retimed a month ago, so this is not a welcome sight! Luckily, I don't appear to have machine issues now. The upshot is that because batiks are tight, it is very worth your while to prewash them because they do soften some. I would even go so far as to say, use a regular cotton backing fabric too. The Neimeyer quilts have many, many seams and thick intersections, which makes it even harder, as they are typically done in batik fabrics. I knew I was forgetting something...Seven more hours to quilt a couple of matching pillow shams! I took a couple days off after finishing the quilt to work on some class samples for next yr though (I call this sanity time!). No rest for the weary...Another (is this #5?) one of these is loaded and ready to start tomorrow. This is definitely a 2-week project. It will be good to have it out of the way before I go to MQX in 5 weeks though. With what feels like a wave of a wand, summer is over. It is oddly September. My kids went back to school last week. I feel behind. I am behind, but hopefully will do a little catch up in the next month. Last week, or maybe the week before, with the prospect of a huge quilt going on my frame (you will see in a moment), I loaded up a couple of samples. The first is one for my Dense & Dainty fillers class, which I will be teaching again at MQX Midwest next month. I changed the background fabric as well as how I will approach teaching the fillers over the last show, and wanted to get a sample made that reflects the class project. The fabric my April class used is this cute Arabesque print, which I also designed, but despite being unique and playful, and similar to my sample, it proved more challenging for some students to stick fillers into these spaces. Hopefully, my change is a good one. The other sample I made will go with my templates (aka "Ruler the Roost") class, and is actually for an article coming out next year. It is all about the small circle templates that are available. I love getting to "play", and just mindlessly quilt. This is just a snippet of the sampler. Earlier in August, my daughter and I had a day project -- yes, a quickie 1-day project to make a quilted donut pillow! First we loaded up her piece of donut fabric. She found this in Paducah, and I honestly had no idea what she would do with it. It is quilted with easy straight lines -- channel locks to the rescue. The quilting took her about 20 minutes. Then I helped her cut up the minkie, and make velcro facings (whoops, just remembered we still need to add the velcro! ), and she stitched these on her machine. At most an hour later...viola!...a finished soft & snuggly pillow. Happiness. I have started adding applique to these log cabin blocks. The flowers are all pink and orange, and to keep them from totally blending into the logs, I have added a good bit of teal and shades of green. Hope it does its job. Two down, three to go. Then the wide appliqued borders. Hope to get these actually designed on paper soon so I can have the pattern for prepping the appliques. Too many other things eating away at my time lately! That fact is not completely a bad thing though. I had a couple days last week dedicated to "tidy up" on my next show quilt, which will debut at MQX Midwest next month. I think it is done... How The Twisted Sister does is now out of my hands. My baby turned 10 a week ago. She always has crazy birthday cake ideas for me to make happen. Someday I will go back and post photos of all of them. On Saturday, I took my 12 yr old away to the ocean for some one-on-one mom time. We spent the afternoon climbing on the rocks at the ocean, and searching for treasures. I put on 10000 steps, so it was no shabby workout either! This ginormous 106" client quilt has been on my frame a week now. She requested dense custom, and boy is that what I am quilting. It might still have 2-3 more days left, and then I have 2 pillow shams to quilt. I am at the point where my psyche is screaming "Get Me Done!". It's a busy month at the shows too, which I am trying hard not to think about. I have 2 at the Wisconsin Quilt Expo, which is this week. There are two at AQS Chattanooga, next week. Then the week after there is another show. Sometime in the next 2 weeks, we will hear about Houston awards. I am really trying to forget that fact. Early October is PIQF, another AQS show, then MQX. It is busy! Just when I think I cannot possibly fathom having to quilt another Ladies of the Sea quilt (I do have 2 of these patiently awaiting me! ), I get an email like I did today. This is Robyn, and she's from Southern CA. Her Ladies of the Sea quilt (on the rt) won Best of Show at the San Diego show. The quilt on her left won a 2nd in Traditional Applique! This show even pays the entrants a nice check. 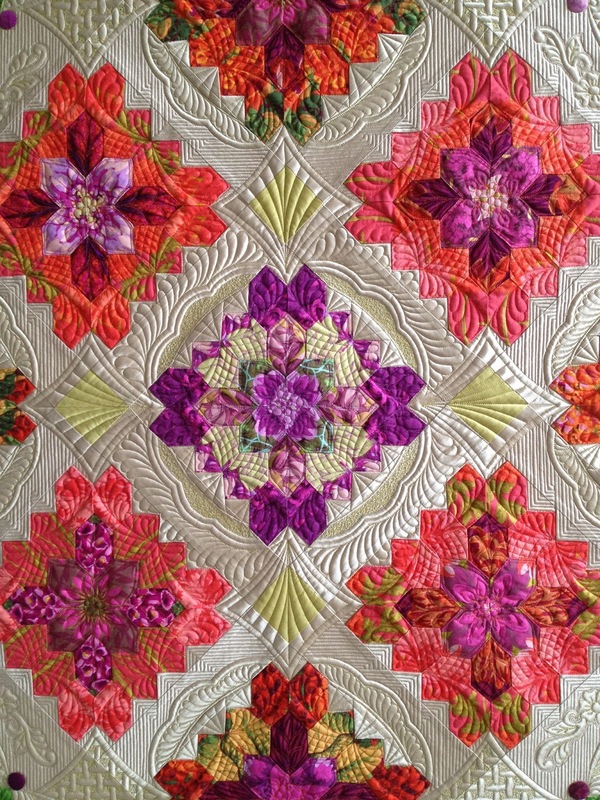 Many of my clients are so amazingly talented, and I am blessed to be trusted to quilt their masterpieces. If you are in the area, it looks like this is a good show to visit the next two days. Congratulations, Robyn, can't wait to see what you make next!